JUST SIGNED San Jose Earthquake Julie Veee has a great deal more to be thankful about from soccer than just the fact the sports is his current means of livelihood. The sport was the means by which he gained his freedom from communism. Newark's Johnny Moore, assistant general manager and versatile player for the 'Quakes, announced the signing of Veee yesterday. Then after making sure the story wouldn't cause any harm to anyone, told how Veee made his way to the United States. "He was playing for the (Hungarian) Youth Team All-Stars when he was about 18 and the communists let him go with the team to play in a game in Italy in international competition. "After the final game he just took off. Split. I think he spent some time in what you call a refugee camp, but one international coach was keeping an eye on him because of his soccer playing ability. "Soccer got him out and he made his way to the states. He came to LA without any fanfare and played semi-pro in LA. I think he had a job laying linoleum. "Then when the North American Soccer League team started he just walked in as a free agent." That was six years ago, and he will see his parents for the first time since when they arrive in about two weeks. "It will be their first time out," is how Moore looks at the trip from a communist country to the U.S.
"The next year another player did the same thing, and as far as I know he is still in a refugee camp. Anyway they won't let him out of Italy. Now you have to be 27 before they will let you play out of the country,'' Moore adds. That way even if a person defects he is on the road down as a soccer player and it won't be as big a loss. But Veee is just about at his peak, now, and is expected to be a big plus to the Earthquakes. He is rated as one of the fastest players in the NASL. "He is basically a midfield player. He can get the ball through and take people as he gets the ball through. He doesn't score much but he's a safe ballhandler type of ball player," Moore evaluates Veee's main value to the team. San Jose also has obtained rights to Tony Douglas, a speedster from the Trinidad World Cup team who can play midfield or forward, and is expected to sign him soon. "Douglas could be a real sleeper. LA never gave him credit. He's fast and he can play through to get things going...and he will give problems down the sidelines, too," Moore says of Douglas. last season the indoor really took its toll. "At the start of the season we were really off with injuries. We lost five of our first seven we played at home. And it's tough to makeup on the road," Moore looked back. Moore is hopeful some modification of the rules for the indoor season, plus less games for the 'Quakes will help with the injury problems. There is no doubt the indoor version presents more hazards, but Moore reports the 'Quakes will have an entirely different training schedule this year also, which he hopes will lessen injuries. But ultimately what is neccessary according to Moore is for the indoor season to be held earlier so there is more time before the start of the outdoor season. In any ease, a number of the Earthquakes are currently busy playing combination basketball and soccer games throughout the Bay Area for benefits. Earlier this week they raised $2,200 at Canada College to benefit a student with cancer. Unlike most such events involving pro athletes, the Earthquakes donate their time. Recently they helped raise almost $1,000 for the Newark Soccer Club and Monday will play at James Logan High to benefit the student newspaper. "We can't beat say a basketball coach in the basketball part of the games, so we have just developed some routines. Really, we put on a show with a lot of gimmicks," Moore twinkles. The Earthquakes also unveiled their 1975 highlight film yesterday. It is 13 minutes and will be available to groups starting next week. 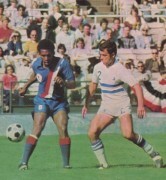 Any group interested in showing the film should call Tom Mertens at the Earthquakes office in San Jose. "Right now we also think we need to do whatever we can to help college soccer the area," Moore said. "We think that is the area that needs help now." To that end the Earthquakes are sponsoring an Indoor Soccer Classic with San Jose State, California, Santa Clara and Stanford tonight at Santa Clara's new Leavey Activities Center. "We will just be there tonight; not actually playing," Moore related. "But we will pick an all-star college team to play next week. Tonight's schedule has San Jose meeting Cal at 6 p.m. and Santa Clara vs. Stanford at 7 p.m. Then the Earthquake Shakers will meet the Santa Clara Cheerleaders in a women's contest. That will also give the two first game winners time to rest for their 1:30 p.m. championship match. Tickets are only $2.50 and $1.50.